Some time ago, I received an email from Mr. Franco (I am not using his first name because I'm not sure he wants me to). He asked me if I happened to have any Julio Franco cards that he might need. Of course, I am dense as dirt, so it took a few emails back and forth before I finally asked if HE was related to Julio Franco. He is not, though his son is a huge fan of Julio's and Julio even made a surprise visit to Mr. Franco's son's school to visit him as part of a fundraiser Mr. Franco's son had headed up! It turned out I only had 1 (maybe 2) of the cards he needs for his collection of Julio Franco cards, and I happily sent those along. I am hoping that he and I can get his "want list" down to nothing! :-) In the meantime, however, he sent me a padded envelope with ALL KINDS of Tribe goodies! Mr. Franco had told me that he wanted to send me some "Gatorade cards." I had not heard of these before, so I was anxious to see what they looked like. Well, again, he sent me a bunch of them!! There are cards from 1987 AND 1988! SUH-WEET! I have to say that when I pulled this out of the envelope, I knew I was going to be on a mission to hunt down any and every Julio Franco card he needs! 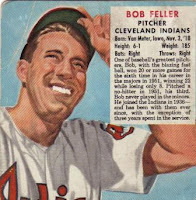 This is a 1953 Red Man BOB FELLER! UN-believable! 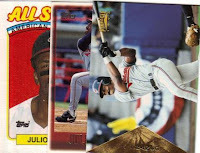 In order to help him out, I am posting his Julio Franco want list below. If you happen to have any of these, let me know and we'll work out a trade so that I can get them to Mr. Franco. Thanks! 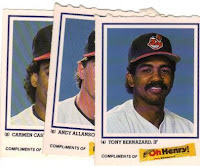 Have you ever actually seen any of the 1986 Indians Team Issue cards? Several web searches result in nothing but checklists and wantlist, but no one who actually HAS any of the set. I'm hunting the Bernardo Brito card, myself, so I thought I'd ask. No, not the Oh Henry cards, according to Beckett, in 1986, there was another 52 card team issued set. From their picture in the Beckett Almanac, the card is almost entirely a player portrait with very thin white border and just the player's name, position and team at the bottom. It also says the card backs are "black". I'm not sure if that's a typo for blank" or not. It says they were unnumbered. SCD doesn't have a listing for these cards. Now, having read the previous post more closely, it would appear what I'm looking for comes from that 1986 b&w postcard set.